De Waterkant is part of the Bo-Kaap, situated on the slopes of the iconic Signal Hill and is flanked by the excitement of the City Bowl and the V & A Waterfront. It is, therefore, centrally situated, right in the heart of the action and activities of Cape Town, one of the world’s top tourist destinations. The architecture of De Waterkant reflects the Cape Malay style of the slaves that were the first residents of this now-coveted suburb. These ones were brought to the shores of South Africa in the 1700’s, and established a culture all their own while they lived as slaves under colonial rule. The houses that they built were made from lime and crushed seashells, which was a successful combination that made for a very durable plaster. They had a family-oriented community, and the entire area was once characterised by children playing in the streets, families going to church and mothers cleaning and preparing their homes. Today, the Cape Malay people still make up significant proportion of the local society, having moulded modern society to a significant degree. Their cuisine and culture can be appreciated throughout the Western Cape, but also in De Waterkant and surrounding areas, where tradition meets the ultra-modern appeal of the Mother City. Despite this strong influence, there is also a distinct European inspiration behind the look and feel of De Waterkant, which gives it a cosmopolitan elegance. 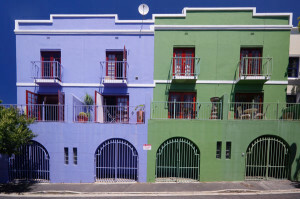 Tour guides based in Cape Town usually offer formal tours of De Waterkant and the Bo-Kaap. These tours showcase the local architecture, as well as historical buildings, museums, mosques and eateries. Experienced guides will share their insights into the customs and history of the people and the places that they called home. Enjoy the finer things of life at De Waterkant, which is brimming with lifestyle and décor shops. These offer an array of local and international pieces that are sure to infuse your home with the modern side of Africa. The Cape Quarter has a lively ambience that comes from the great combination of art galleries, health and beauty spas, shops, boutiques and an array of places to eat, drink and enjoy the views. In addition to its history, De Waterkant is now an urban epicentre that is alive with salsa clubs, tapas bars, sidewalk cafés, and restaurants. It is also a veritable hub for gay clubs as well as other night clubs and trendy bars. This gives it a buzz that extends far beyond sunset and lures the party animals visiting Cape Town to enjoy great music and rhythm.